Taking ownership of our lives and what's happening with us can be a powerful tool in helping us become the best versions of ourselves. However, sometimes we take responsibility for too much. If we accurately take stock what's happening inside us and how society can be influencing us, we can make ourselves more resilient and better able to engage with the world in a meaningful way. In our work in addiction treatment, it is so common to see people come in with individualized stories of failure: how I'm blowing it in life, I can't manage my stress, or I don't know how to deal with my relationships, or my trauma is haunting me and I'm failing. 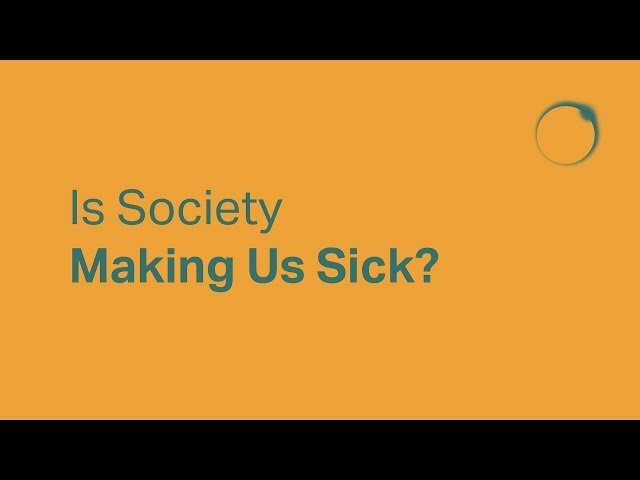 And while of course it's really powerful to take ownership of our role and what's happening with us, I think it's just as important to also look at how society is making us sick. I would say that the thing that most of our clients--everybody that we work with--are dealing with is feeling isolated, feeling alone. Even in our field, it is common for professionals to look to the individual to wonder about the impact of their trauma in creating isolation, to look at their patterns of behavior and try to identify where that person is contributing to their own isolation. And again, while I think that trauma can certainly create isolation and we can improve our ways of connecting, it's also important to look at the world we live in that promotes isolation. We work a lot. We are busy in the process of trying to attend to our needs, which doesn't leave enough room or time to connect with other people, even if we have the energy to do that. And the reason that we talk about this is that in the therapeutic setting, we have learned that it is important to deal with the individual and what's happening inside, and when we couple that with also looking at how society influences us, it creates a tremendous amount of resilience and folks are able to engage in the world in a much more meaningful way.